Thomas Clarady, son of a wealthy privateer, is a law student at Gray's Inn, seeking to climb the Elizabethan social ladder by any means necessary. When his tutor is murdered during the Queen's Day pageant, he hires the young Francis Bacon to replace him. Francis is requested by his uncle, the Lord Treasurer, to investigate the murder. Eager to curry favor with his powerful relation, he agrees, even though he rarely leaves his chambers and mislikes anything that takes time from reading philosophy. Far better to send Tom out to find clues and talk to witnesses. At first, Francis suspects that Catholic conspirators murdered the lawyer to keep him from exposing their plans, but other motives quickly emerge. Renowned beauty Lady Rich fears the scandal of being dragged into court. High-tempered Sir Avery Fogg will stop at nothing to achieve a judgeship. 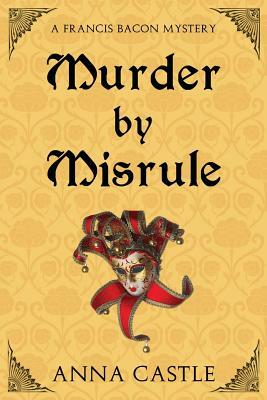 Other barristers contend hotly to succeed the murdered man to his legal honors, fine chambers, and wealthy clients. Francis and Tom embark on an investigation that reaches from Whitehall to the London streets. Francis does the thinking; Tom does the fencing. Barristers fall down stairs -- or are they pushed? Tom falls in love with a crucial witness and then can't find her again. Everyone has something up his pinked and padded sleeve. Even the brilliant Francis Bacon is at a loss -- and in danger -- until he sees through the disguises of the season of Misrule. Anna Castle has earned a series of degrees -- BA in the Classics, MS in Computer Science, and a Ph.D in Linguistics -- and has had a corresponding series of careers -- waitressing, software engineering, grammar-writing, assistant professor, and archivist. Historical fiction combines her lifelong love of stories and learning. She physically resides in Austin, Texas, but mentally counts herself a queen of infinite space.